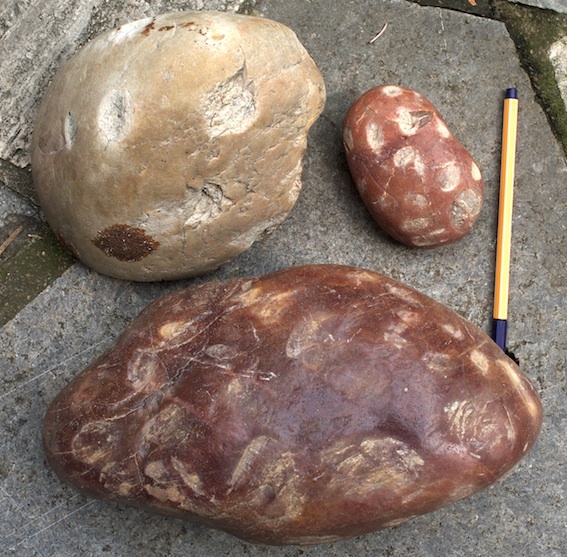 In northern Spain, basal Buntsandstein conglomerates are exposed in large areas to usually display distinctly pock-marked and cratered surfaces of the quartzite components. These features are well known among geologists and are regularly explained by pressure dissolution from tectonic or/and overburden compression. A closer inspection of the conglomerates and thin-section analyses of the quartzite cobbles, however, show (Ernstson et al. 2001) that there is no dissolution evidence. Instead, the surface features prove to have a pure mechanical origin. As is in more detail described in the comments on the images, the deformations are suggested to have been caused by shock waves from the large Azuara/Rubielos de la Cérida doublet impact structure in the vicinity of the conglomerates. The shock waves and associated mass flow have led to internal accelerations of the quartzite cobbles, multiple collisions, reverberations and spallation. We suggest, that even at low impact velocities (of the order of 10 m/s), strong compressive and tensile stresses occurred due to reverberations and focussing effects in the cobbles. This is substantiated by shock experiments on artificial conglomerates conducted at the EMI in Freiburg (M. Hiltl), the results of which are shown and discussed in the section on impact experiments on sythetic conglomerates. The pock-marked and cratered cobbles are usually related with an intense, closely spaced subparallel fracturing, which can be observed on both a macroscopic and a microscopic scale. These deformations are suggested to have formed also in the large impact event. A thermomicrometric analysis of the decorated microfractures and their fresh-water fluid inclusions has established hydrodrothermal conditions at about 200 °C trapping temperatures and pressures between 0.11 and 0.26 GPa (see I.Siegert, 1997, Diploma thesis). A similar thermal signature has been found at the Siljan Ring impact structure (Komor et al. 1988). The study of the Buntsandstein cobbles and their peculiar features show that shock deformation of conglomerates can provide an easily recognizable regional impact signature. In the map below, both the encircled impact structures and the investigated Buntsandstein deposits (black) are shown. 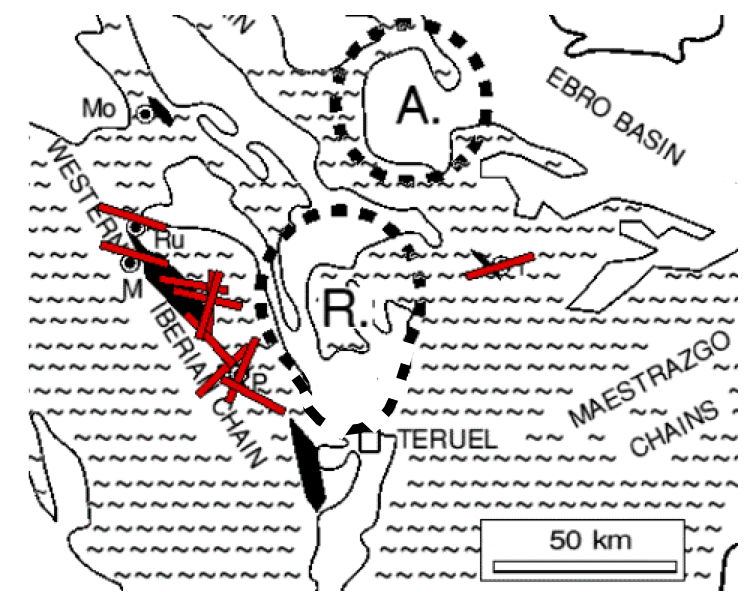 [A = Azuara impact structure, R = Rubielos de la Cérida impact basin, M = Molina de Aragón, Mo = Monasterio de Piedra, P = Peracense, Ru = Rueda de la Cierra, T = Torre de las Arcas]. Red: orientation of subparallel fracturing; see here. The common explanation of these deformations as to originate from overburden pressure dissolution and tectonics, speechified since decades to geologists and in all geological excursions, has no scientific basis. Even the “normal” non-geologist is convinced – we’ve made many tests – that the deformations can be explained only by a very rapid and powerful event. This event was the giant Mid-Tertiary Azuara impact event with the formation of the Azuara impact structure and the Rubielos de la Cérida elongated impact basin.